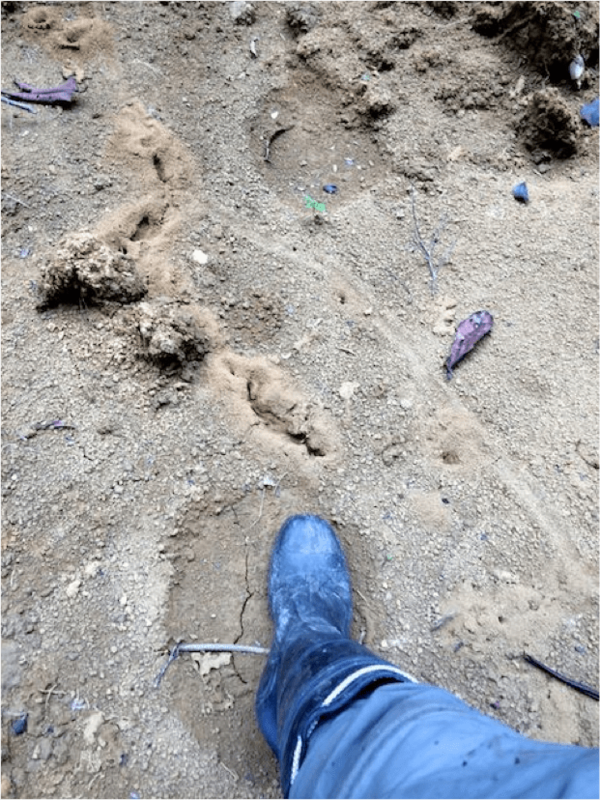 You would think given the title of the blog, or any other fieldwork I’ve done over the past ten years or so, that I would know better than to count on plans going as planned. Of course if you did think that you give me more credit than I deserve and you would in fact be wrong. The first day of the transect that i discuss here was only marginally more challenge fraught than any other. But I thought I’d take the opportunity to lay out for you the methodology (aka the way things ought to go) and the way things did go for comparison.You’ll have to take my word that the difference between these two that transpired the in the day I’m about to describe is indeed a fair representation of about how most days go. I wish that were not the case. Day 2-5: Check traps each morning, process and release captured rodents, re-bait traps, and check exclosures. 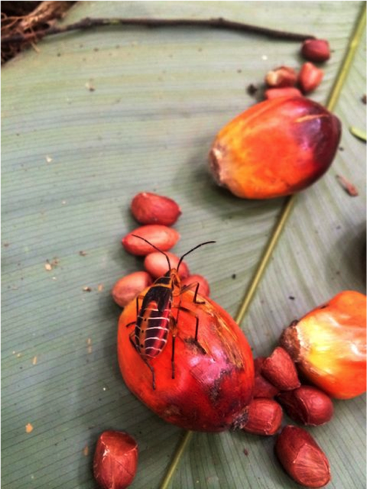 From late morning to late afternoon collect environmental variables surrounding traps. Having woken up at the harrowing hour of 5:30 to make sure everything was ready to go for a 7am departure, the first deviation from the plan came when the more punctual of our chauffeurs decided he would wander up from his bungalow twenty five minutes late. Mind you said bungalow is only a five minute walk or a thirty second drive but I accepted this with a gentle plea that he try to come at agreed upon times for future transects. The next came fifteen minutes down the road when I realized I had left one of the tents for the guide back at the station. Micki, took the opportunity to get his back for my previous comments, huffing and puffing impatiently and telling me how I should really make sure to bring all the gear that’s needed when we go on a trip. I thanked him for this helpful suggestion and we wasted a bit more time driving back putting us a solid 45 minutes behind schedule. Nonetheless, for fieldwork in Central Africa that’s still pretty much ahead of the game. In Loala, the village adjacent to the park where we stopped to pick up Rowjay and Moliere, the next hiccup surfaced when the man we’d paid in advance to be our ‘reliable’ source of palm nuts, had none to show for himself. This raised the blood pressure a bit but we managed to find some in the market in Makoku with only fifteen or twenty minutes spent. We finally headed off in earnest, at this point about an hour and a half behind schedule but still in high spirits. Mine were buoyed by the presence of Cooper, John’s doctoral student, and his wife Rachel, who had come along to do some work on the same transect. They had sweetly packed me a ‘snack pack’ of the leftovers from the tasty meal they had served me the night before. In the car Micki talked with Rowjay in their typical clipping cadence but I made out “transect vignt un” (transect 21). 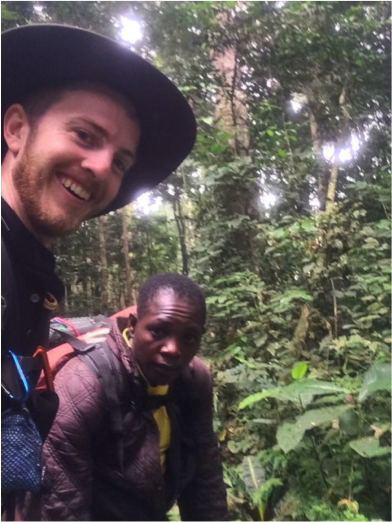 I had talked to Micki two days earlier over the map of the transects to make sure he knew we wanted to do 21 and we concluded the village to depart from was Ebieng. When I talked to the others about “Ebieng” (they often refer to the transects not by their numbers but closest villages) I remembered they described a pretty easy march to the site, so I had planned the pack weight and timing of the day accordingly. Rowjay said something to Micki about it being a long march but I didn’t think much of it, chalking it up to the typical exaggerating of necessary labor. We arrived in the village and thankfully found Cooper and Rachel’s guide without issue. We then located the Chief’s house and knocked on the door. His wife opened the door, an attractive perhaps 24 year old holding an infant in one arm with a shy toddler hiding behind her skirt. She smiled prettily and greeted us before shouting loudly for the chief into the house. A man in his mid sixties emerged scratching the grey hair on his chest and belly while regarding us bemusedly. We greeted the chief and Rowjay explained the basics of our mission. Five days in the forest. Camping etc. The chief looked to me and asked something I missed entirely having expected some question of the work. On repetition I realized he was asked whether we had brought a pair of boots for him. A bit taken aback, I said that we didn’t think he would want to come into the forest with us, so we had not. He laughed at the clear absurdity of my response. No, he meant as a ‘gift for the chief’ patting his chest reaffirming that to be him in case we had forgotten. I apologized and told him I would check with the other when I got back (they would of course say ‘no’ by default given our budget). His face returned to the somewhat inscrutable look of before as he regarded each of us. We stood in an awkward semicircle oriented towards him and his young wife who seemed amused by us. His children (presumably some from other wives) spilled out of the house and fanned out to look at us from various shy vantages. It was the wife in fact who spoke next. Quite firmly she demanded we produce for the chief our “carte de mission.” Confused by the expression I said we were on the same project as the others. Neither the other field assistants nor John had ever mentioned bringing documentation of any form to the chiefs. I said the others would bring it next time if he wanted. The young woman squared her baby-free hand on her hips in the no-nonsense pose I think only mothers can master. She said rapidly and forcefully something the likes of ‘well you have to have a mission letter. It should say how many you are, where you will be, what you will be doing and for how long.’ This scolding list happened to be exactly the information that Rowjay had just told them. I stifled a disrespectful urge to smirk knowing full well that piece of paper would be the only ‘administrative’ document within 15 miles of here. Rowjay thankfully stepped in and mustered a much more sincere vow that he would try to bring one next time than I could have probably mustered. He offered this of course being well aware the we would not be coming back to this village for our work. The young wife had softened up a bit and her expression returned to the same bemused look of before. The chief at this point turned to Rachel: “Can I marry this one then?” That comment I couldn’t help but laugh at. I was immediately relieved to see it had in fact been a joke as the other’s laughter cracked his grave expression into an impish grin. Rachel hadn’t caught the comment and I relayed the message to which she didn’t really have a response. I told the chief then in the respectful ‘vous’ form that he would ‘have to take that issue up with Cooper’, pointing, ‘her husband.’ He laughed then and raised his hands saying it was just a joke. We then stood their shifting our feet for a little bit. The silence was lighter than before but nonetheless a bit awkward. I realized during this time he was probably shaking us down a little bit to see if he could get any more than just a cigarette from us in exchange for his consent. This ‘big man’ behavior was so much more mild than the tactics of the machine-gun toting colonels and captains at road checkpoints in Nigeria when I was a kid that I had almost missed what was going on. But he wasn’t too serious about the task. With another mild scold about bring “le carte de mission” he finally let us go. More than a couple hours now behind schedule we hastily readied the bags and bid Micki adieu. We slogged along as a big group for a little while up and down the hilly terrain. Rachel, Cooper and their guide hopped like gazelles up the trails, while we lumbered with out metal traps and cages, plus tents and six days of canned food. I reminded myself it was just a couple of kilometers and watched my feet as I plodded up a particularly steep hill. I notched then that the trail was surprisingly well defined and smooth. A few more steps and I started to make out the faint circular shapes, often framing the bootprints of the three ahead of me. The trail was covered in elephant prints. Who had started the trail was a good question but this trail was clearly as much an elephant trail as a human trail. When you dialed your eye in you could see them everywhere. The pack seemed a little more manageable somehow thinking of them. After all, what’s seventy pounds next to a few tons. Still the beast of burden trio of my team could not keep up with Cooper’s so we told them to go ahead and we would meet them somewhere along the transect after we’d made camp. A bit after they’d left with another thirty or forty minutes plodding under the belt I realized this walk was maybe more than a couple of kilometers. I asked Rowjay after about an hour and a half of walking about how much farther it was to the camp. He didn’t know the exact distance but he said it would be another couple of hours. Couple hours!? Clearly there was some confusion. I pulled out the map of the transects. I related in confusion how the others said Ebieng was just a short walk to the transect. ‘Is this not transect 21?’ I asked. As a rule I try not to teach beginner English speakers curse words, even if they plead. I always think it a shame when of a handful of words that someone knows in another language the majority are maledictions. Though I’m not proud to say it, I’m sure Rowjay is clever enough to have learned a few swear words from my reaction to that situation. I suppose what had happened was that we had misinterpreted the GIS map the previous group of field assistants had made. They had selectively removed the names of the villages for all but the closest to the transect. But the names hovered in somewhat random positions. Both Cooper and I had figured that Ebieng which was below and to the right was associated with T21 and that Minkouala which lurked farther to the left on the opposite side was for the next transect. We must have both then heard the others talking about the “Ebieng” transect and assumed they meant Transect 21. How wrong we were. When I met up with Cooper later in the day he had come to the same realization and was equally shocked. Whoever, made that map must have had a hard time with the grading scheme of the GIS fundamentals class at the Nic School (Pete Harrel would have gone to town on that map). 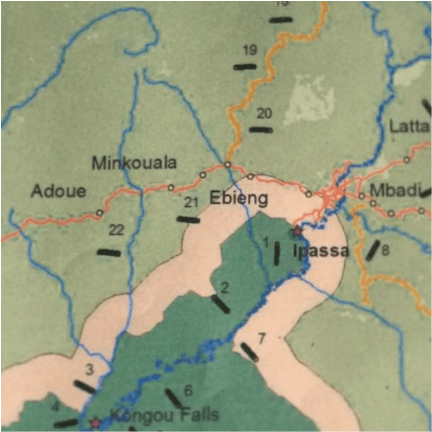 The map in question…Note the placement of “Ebieng” in relation to “21”. Well there was nothing to do about it at that point. C’est la vie. Or as the guides here more commonly say “C’est la realité de la terraine” (That’s just the reality of the terrain.). We were already well along the way so we might as well press on. It really turned out to be a hell of a march with those overpacked packs. 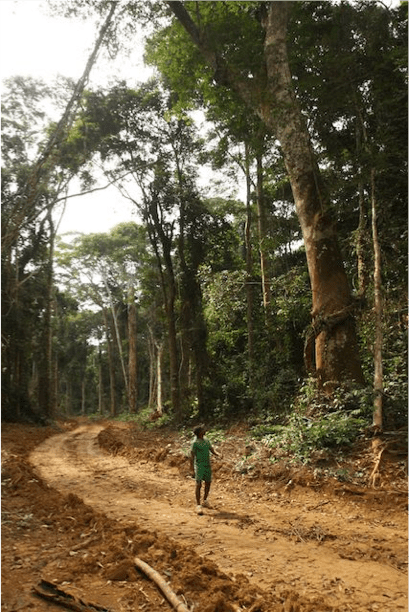 Probably around five and a half jungle kilometers just to the camp (and if you have forgotten that feels like more than eleven road kilometers….see my first Gabon post for the derivation of that figure). Cutting a kilometer of through this is perhaps less fun even than it sounds. After that we had trouble finding the camp. After finding it we had a hasty late lunch then pressed on. We had brought 5days of rations so we had to get the traps up the first day. We quickly walked the 1.5km to the center of the transect with the traps, cages and bait. I cut the first trap line off the corner of the vegetation plot as planned. I hacked and slashed my way through 150 meters of scrubby forest when I hit a particularly dense thicket of spiny vines and lianas that seemed oddly backlit. Beating my way through with an increasingly dull machete, I suddenly emerged into the bright sunlight of an old road. Roger trailed behind me with the measuring tape and stopped to place a trap right in the center of the road. I stopped him to think, uncertain what to do. 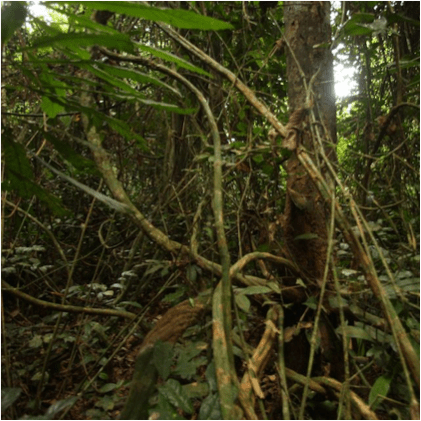 The only other study of rodents in Central Africa that I’d found was one on the effect of logging roads and it had found rodents increased beside them. A conundrum then settled upon me. I was not interested in testing the effects of roads exactly. At least not their acute effect. Not to mention putting the trap as it fell randomly would land one in the middle of the road, in a bald patch of hard-packed earth and the next trap on the unnaturally steep embankment. Herein lay the dilemna. There were obvious confounding influences going on. These traps were also almost certain to catch nothing, and not because there weren’t rodent around but because they were completely exposed and highly unnatural. But random is random and we don’t want to bias the data. Unfortunately I don’t have the luxury of enough replicates to deal with major confounds. Mopping sweat from my brow and checking the time, I decided we would pull any traps that fell within a 10m radius of any roads and add them to the end of the line. I then continued cutting. Rowjay cut the next line while I directed with the compass, and I cut the one after. Moliere was beat after the hike and never did bushwhack quickly enough to make it worthwhile so Rowjay and I made a habit of trading off. The trail began descending fairly steeply as I cut now through more open forest. We reached the bottom of the hill after four traps and went to place the next. However the descent had leveled off in a swamp. I felt torn again. Still feeling guilty from the last shift of methodology I made, I hesitated to make another change. On the other had laying a quarter of my traps into a swamp would add a major confound. If my impacted sites just happened to fall into swamps and my protected sites were in terra firme, I wouldn’t be comparing human impact between similar forest types. I dragged my feet, looked around at the thick mud and sopping pools. Perhaps we could cut through to the other side and continue the line. Fifty meters farther and this was clearly not going to happen. At this point though cutting a new line would not just mean shifting the methodology but also that we couldn’t set the traps in time to get back before nightfall. I sighed, reached into my pocket for the random number generator on my phone. We’d just have to make a new line. And we’d have to stay an extra night to get the full four nights of trapping. I was suddenly doubly grateful for the snack pack Rachel and Cooper had packed me. We were going to have to make five days rations last six. I thought hard as we trudged back to camp. Why couldn’t anything just go as planned? Did I make the right call out there? Would Dr. Poulsen have made that call. Would the giants of Ecology frown down at me for the break in protocol? What would Wilson do? But who am I kidding the forest is the forest and I have spent enough of my life now in tropical forest to know that it behaves for no one. I doubt a one of them had a study go off without a hitch. That those polished methods laid out in Nature or The Proceedings of the National Academy of Sciences were always followed perfectly to a T for every last bit of data. Tough calls had to be made and realities accepted. I’d put my money on the fact that the greats had to bend their protocols too. With that I smiled looking down as my foot pressed into the massive palm print of an elephant. It’s not easy, maybe sometimes it’s a bit scary too, but there is a peculiar comfort in knowing that you’re walking in the footsteps of giants.